Recommended use or purpose: Helps temporarily to promote alertness and wakefulness, and to enhance cognitive performance. Adults: Take 1 tablet every 3 - 4 hours, as needed. Do not exceed 5 tablets daily. For occasional use only. Microcrystalline cellulose, silicon dioxide, dicalcium phosphate anhydrous, magnesium stearate. RISK INFORMATION: For adult use only. Consult a health care practitioner prior to use if you have high blood pressure, glaucoma, and/or detrusor instability (overactive bladder syndrome). For a dose > 300 mg per day consult a health care practitioner if you are of childbearing age, pregnant or breastfeeding. Consumption with natural health products (e.g. bitter orange extract, synephrine, octopamine, ephedra) or other drugs (e.g. ephedrine), which increase blood pressure, is not recommended. Consult a health care practitioner prior to use if you are taking lithium. Consumption with other caffeine-containing products (e.g. medications, coffee, tea, colas, cocoa, guarana, maté) is not recommended. This product is not intended as a substitute for sleep. 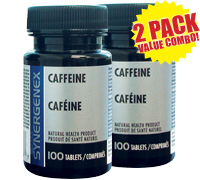 At doses > 600 mg per day, caffeine may cause anxiety, tachycardia (rapid heart rate), palpitations, insomnia, restlessness, nervousness, tremor and headache. Hypersensitivity/allergy is known to occur; in which case, discontinue use.